I am so proud to be associated with this wonderful group of bloggers who are joining me again this week for a tablescape blog hop. This week all of us will be sharing our interpretation of a Thanksgiving tablescape. I hope you have the time to visit each of the bloggers and see what a creative bunch they are! 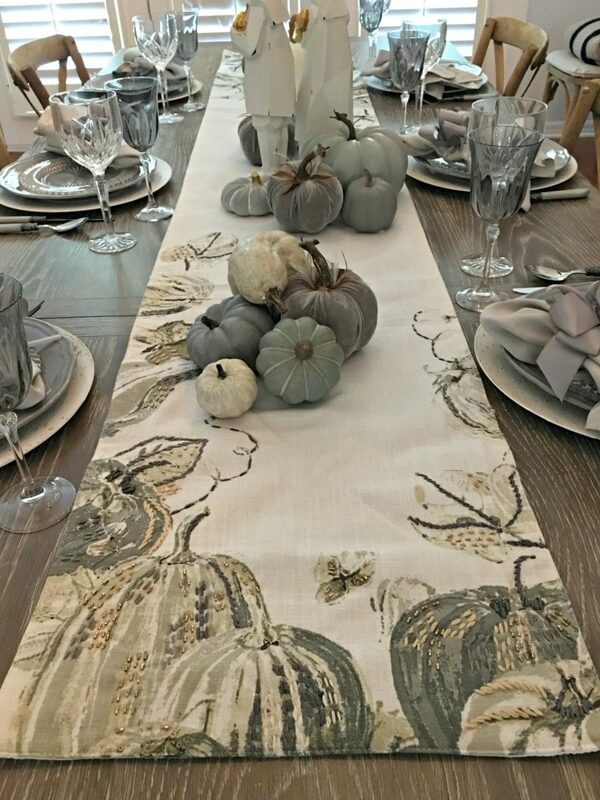 I spotted this gorgeous table runner at Home Goods and knew immediately that my Thanksgiving table would be a statement in neutrals. The colors are grays and tan and that ever popular “greige” . 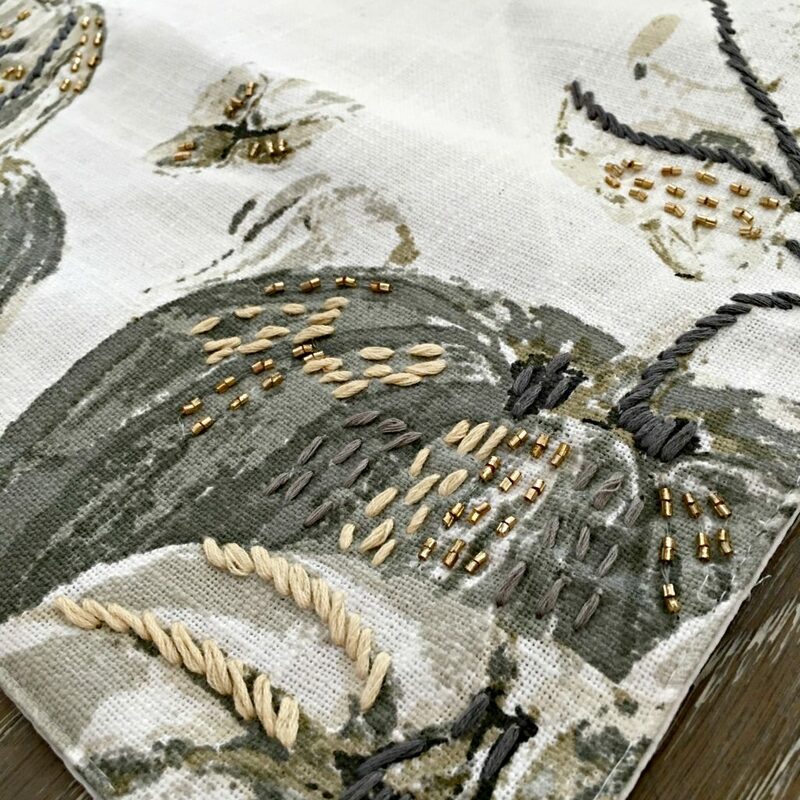 The extra needlework and beading detail on the runner make it so special. After seeing this, I thought I could enhance some other runners in the same way. My place settings are rather simple. A charger with a worn look to it, topped with gray plates from Ikea and salad plates which are depression glass handed down from my grandmother to my mother, and now to me. Flatware is from the Cowgirl Lace pattern from The Pioneer Woman. My pilgrim couple were from Home Goods and made a nice focal point for my table without covering up too much of my beautiful runner. 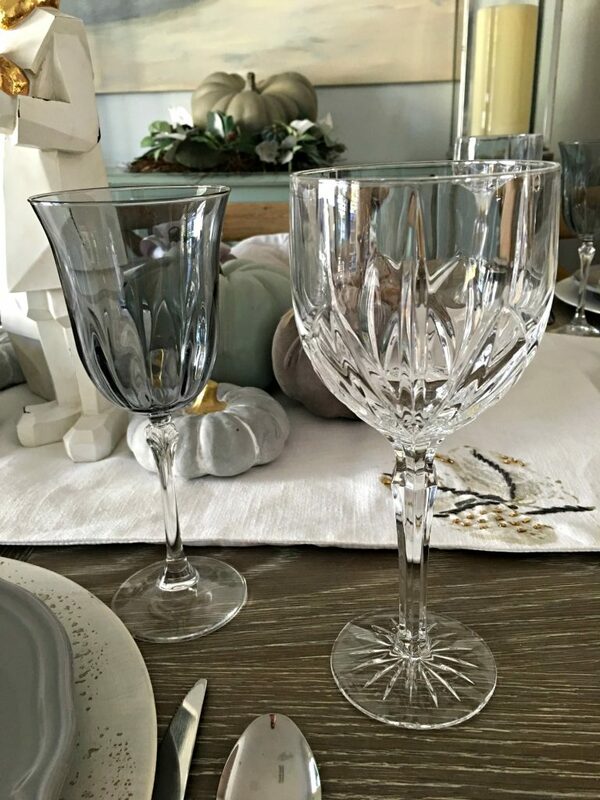 Stemware are a pair of goblets, the gray ones I featured in my Headless Horseman Halloween table, and the others are Marquis by Waterford Brookside pattern. These are my go-to wine or water goblets and can be seen at any number of my tablescapes. The crystal glistens in the light. 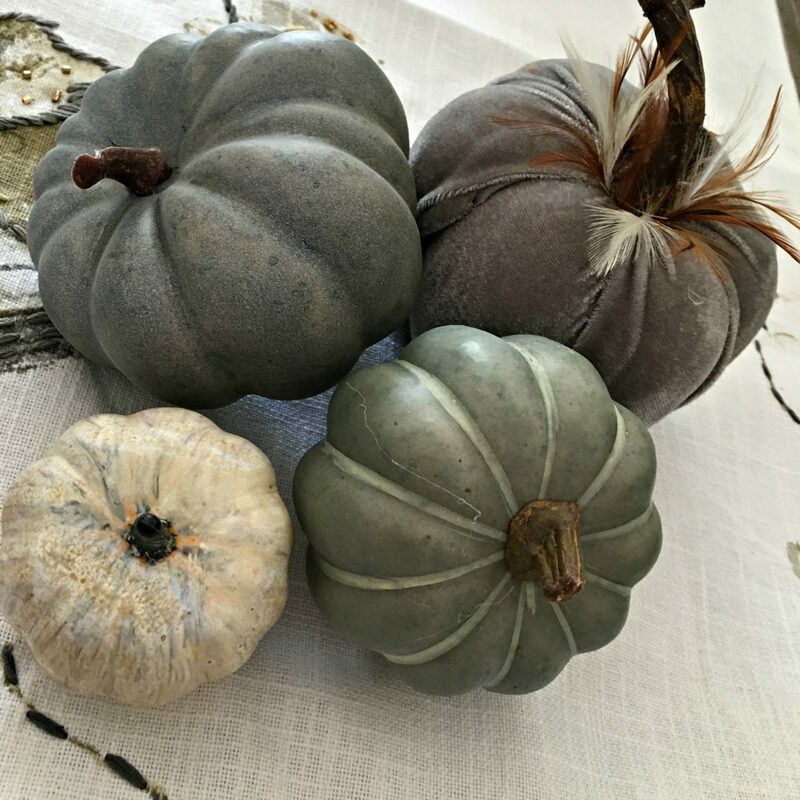 My pumpkins in assorted neutrals blended beautifully with the table runner. The grays on the table blended so beautifully with my sideboard from Ballard Design. 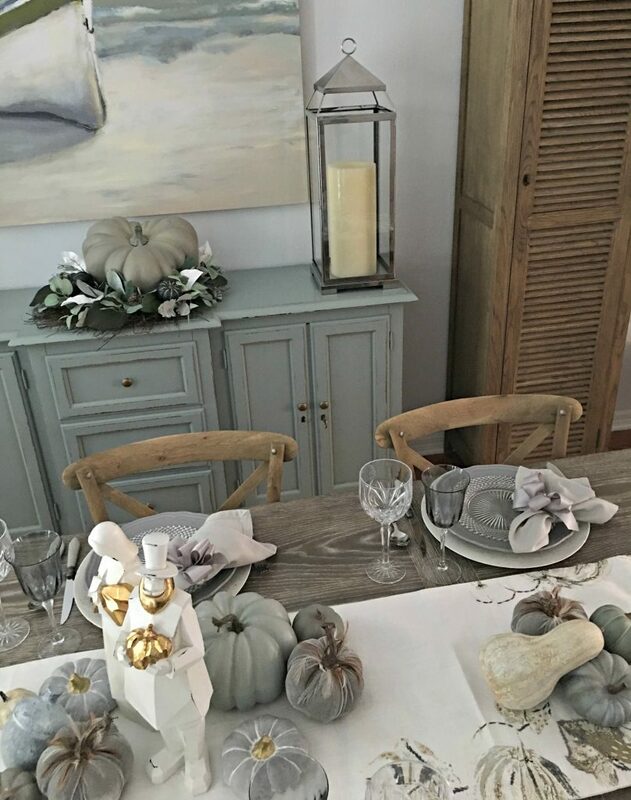 The pumpkin on the sideboard is nestled into a wreath after getting a light spray of flat gray paint. Check out all of these other great blogs and their beautiful tables set and ready to welcome Thanksgiving guests! Thank you so much Mary, that runner really did set the style for the table. Thank you for being a part of another blog hop! 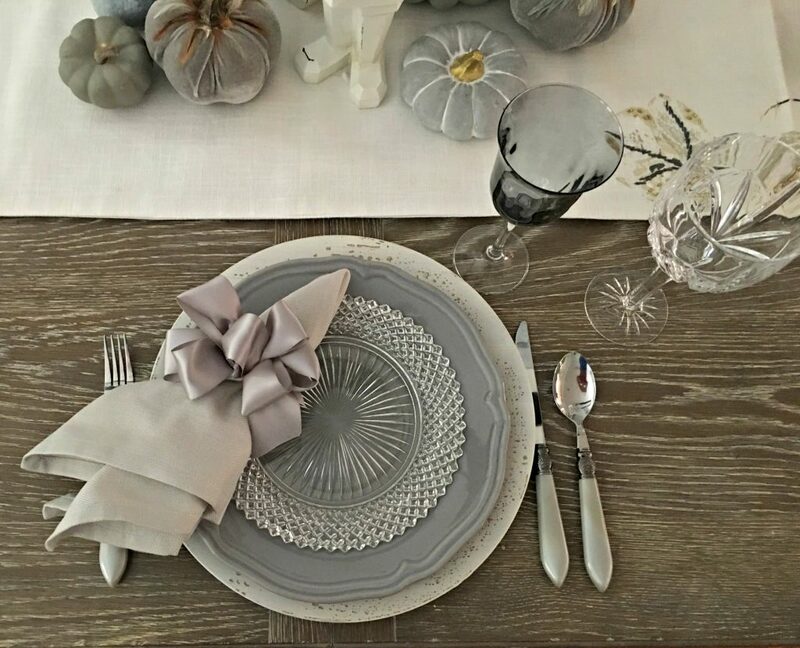 Chloe, the runner is really a beautiful find and you used its neutral tones to set a beautiful table! The pilgrims are very unique and are perfect to enhance your stunning table! I love the Ballard sideboard! As always, thank you for hosting theblog hops and I love participating! Thank you so much, Pam, it really caught my eye! Thank you for joining me in another blog hop! Wow, how very cool and different Chloe! Those pilgrims are fabulous!!! The runner is beautiful in a subtle way, and the monochromatic palette really provides an impact~ It’s so much fun to see non traditional interpretations of this very traditional holiday. Thank you for another wonderful blog hop, you had me cracking up all weekend with the banner spelling situation!! Thank you so much Jenna. 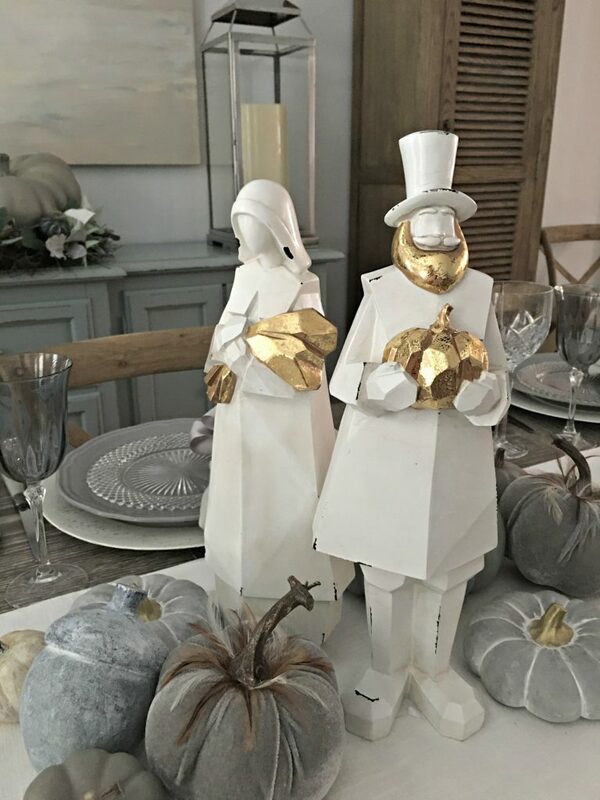 The pilgrims have been a big hit, and were something different while still nodding to traditional Thanksgiving Elements. Thank you for being part of the blog hop, and I am glad I could provide a laugh! 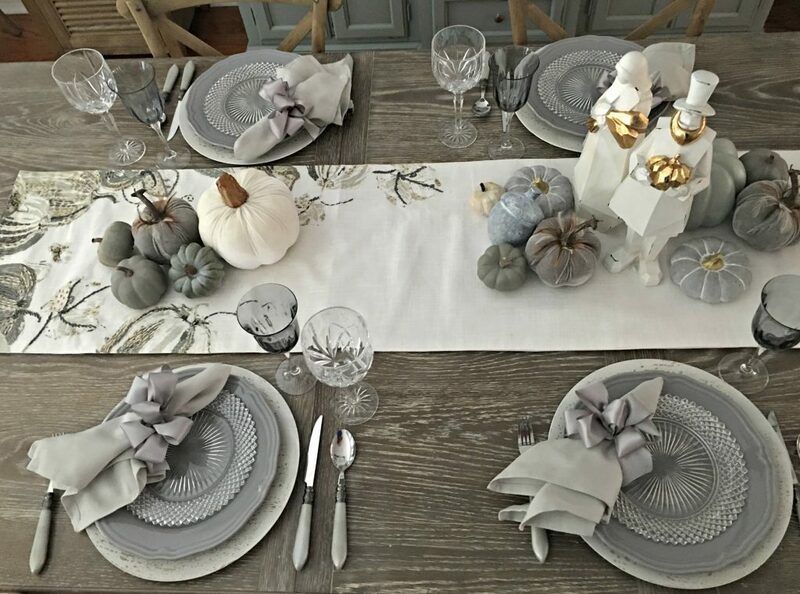 What a beautiful table setting design for Thanksgiving, Chloe! I love the use of non-traditional colors for this impactful display! So beautiful! You are a master at creating fabulous tablescapes! And I love, love, love the bow ribbon wrapped napkins in matching colors! Thank you so much for your very flattering compliments! I am so thankful that I can share my tablescape designs with you all. Such an interesting idea with the neutrals, and you had all the right things to pull it together beautifully. Thank you Carole, it was fun to use non traditional colors this year. I love how your tablescape blends so well in your surrounding room, Chloe. What you’ve done is a perfect coordination of the runner, plates, flatware – all of the elements! – to blend well together, and with the room. Very clean and nice. Thanks so much for hosting this blog hop. I look forward to all these tables and the takeaways for future table ideas! Thank you very much, it was so nice to have you back hopping with us! Okay, this tablescape stole my heart. I love the subtle ambience and the neutral color scheme. So serene, yet so lovingly done. You truly have a creative touch! Also, so happy to be a part of this bloghop. Thanks for including me! Wendy thank you for joining us for the blog hop, and I am thrilled to hear that you liked my non traditional neutral tablescape. Your pumpkins runner is so pretty and perfect for your room and table. I adore your sideboard. I can only image how your mind starting racing when you found the Pilgrims and runner. Your heirloom depression plates add lovely texture and that perfect touch of love from two generations. I have goosebumps thinking about that! I agree your cut crystal glistens and is so elegant! I love it. Thanks for organizing the blog hop. Thank you so much Bonnie. It is always so much fun to spot something that gets your creative juices flowing like this runner and my Pilgrims. Thank you for joining me for another blog hop! Thank you Maureen, this is what I enjoy, too, getting inspired by all of the different takes on a singular theme. The table runner is awesome. I have it in blue so I know how beautiful the stitching and extra beading make it. I absolutely love these colors and the pilgrims. The bows on the napkins are perfect with this color combination. I am enjoying all of your blogging friends’ tables. I plan to look at all of them. Thank you so much Dianne! I think the runner would be gorgeous in blue!! Thank you for visiting, I hope you enjoy all of the tablescapes! Chloe, what a beautiful runner that sets the stage for your gorgeous Thanksgiving table. I know that you must treasure your Depression glass plates, and they add such a pretty touch to your table. Thanks so much for hosting the blog hop. I always have the best time and enjoy seeing everyone’s creative ideas. Thank you so much Shannon! I have really enjoyed all of the tables and everyone’s creativity! Thank you for being a part of another blog hop! 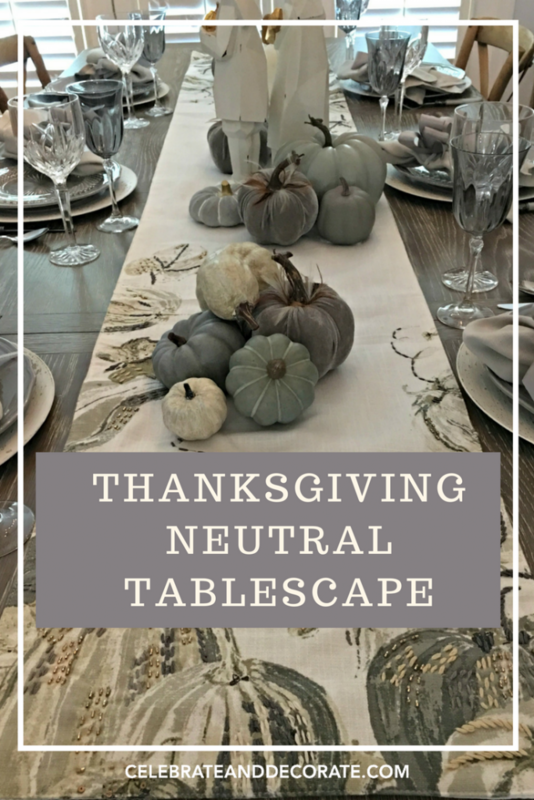 First Chloe, I want to thank you for hosting this blog hop…and second I want to tell you how lovely your neutral thanksgiving table is. I know the table runner was the inspiration and it ties everything together, from your pilgrims to your beautiful pumpkins. I take it your sideboard is new and it is gorgeous, I love it. thanks again my friend, for your inspiration. It was wonderful to have you hopping with us, and so nice to hear that you enjoyed my Thanksgiving tablescape. Yes, my sideboard is new and thank you for noticing! Thank you so very much Kathy! I appreciate you stopping by and leaving a message! So, so, SO BEAUTIFUL. And, those pilgrims? WANT!!! Thank you so much Tim! Check out your local Home Goods! Sometimes I see the same thing in the Ohio stores that I see in Florida! Chloe, the linen and dishes are gorgeous, playing together like a symphony. 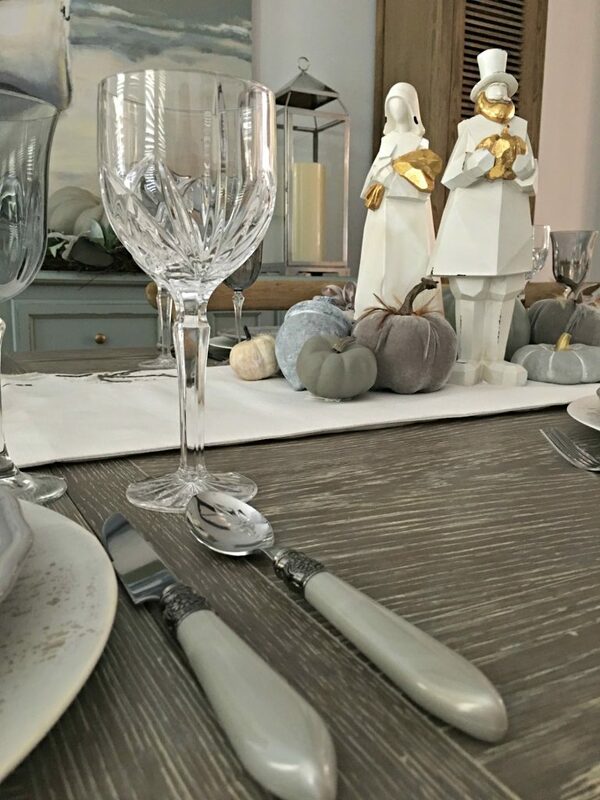 Your figurines, flatware (I love PWs items and her names for them), runner, pumpkins, and crystal are elegant, so lovely this time of year when autumn changes her tune, preparing us for winter. Thanks so much for organizing this event—I’m enjoying the fellowship and inspiration. I really enjoy exchanging our ideas, inspirations, and designs when we hop! I was really pleased with some of the items I found this year such as the table runner and the pilgrims, and have been thrilled to see all the positive response. Chloe, I’m so glad I met you this past summer at Haven and that I’m now part of this blog hop you’ve put together. Your tablescape is so awesome the way everything coordinates and comes together so well. The table runner is amazing and I see why you had to buy it! I have the same Marquis goblets and love them. So much inspiration here and I know from the others sharing! You’ve coordinated everything wonderfully with that fabulous table runner! And all the colours seem to blend perfectly with your dining room including the beautiful sideboard. I really like that pilgrim couple which is a unique centerpiece and like you said , doesn’t cover up too much of the runner. Pretty place settings and stemware add to the terrific tablescape – love the bow napkin “rings”. I so enjoyed seeing this! Thanks again Chloe for hosting the Thanksgiving Tablescape Blog Hop – really appreciate all your efforts especially when you are so busy these days. Thank you so much Lori. I was very happy with how this turned out and can’t wait to see everyone else’s tables! Chloe, I love the soft grays and neutrals. A stunning combination. The pilgrims with the gold accents are a wonderful focal point. And the touch of gray pumpkins ~ wow. Thank you so much for once again hosting a fabulous tablescape blog hop. Loved all the features today and con’t wait to see more. Thank you so much Carol, I am so happy to have you be a part of the hops! I really enjoy seeing all of the creativity everyone puts into their tablescapes. I love that runner! The blue pumpkinsnare so cute!! Love the neutral theme! So cute! Thank you Emily, I really love that runner, too! Chloe, Thank you for including me in these tablescape hops. I love sitting down with my cup of coffee every morning and viewing all of these beautiful tables. Your neutral table is stunning! I saw the table yesterday on Instagram, I believe, and I knew it was from you. I want those pilgrims for my table!! They are fabulous! You always inspire me to set a beautiful table. Thanks! Oh Sherry, I am happy to have you join in, you always do such a great job! Sherry, I really enjoyed designing a neutral and non traditional tablescape this year, and appreciate all of your positive feedback! Thank you for organizing this fun Thanksgiving table scape blog hop. I love the soft colors you selected for your table. And that runner….it is stunning! Thanks so much Tammy! I really love all of the creativity! 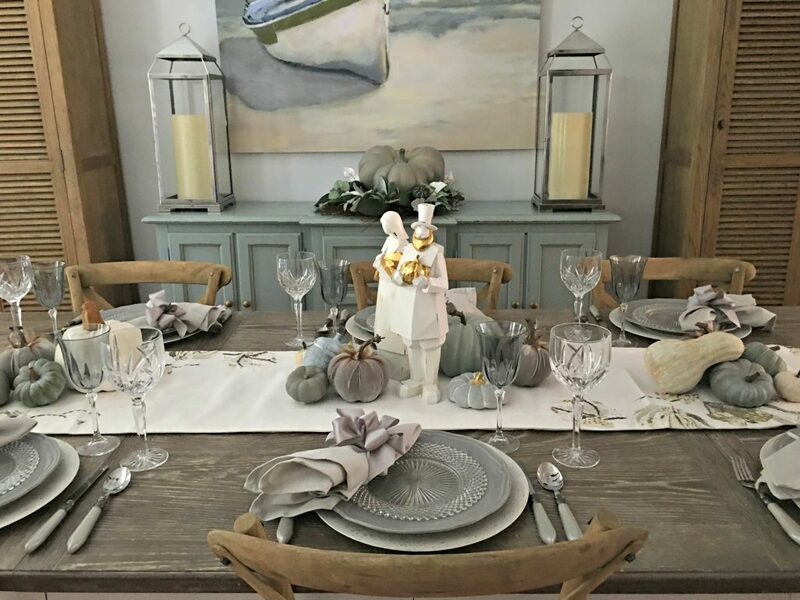 Chloe, your tablescape is so charming with this neutral palette, and Pilgrims figurines are the perfect final touch! I’m so happy to blog hop with you and so many talented ladies! Chloe, you table looks lovely. Loving the neutrals. Thanksgiving can be almost any color. What a great find on the runner for your table inspiration. The Pilgrims are so pretty and unique. I cannot thank you enough for organizing these fun blog hops. Playing catch up since, my NY visit. Thank you for the invitation, Helen, I stopped by! Thank you so much Cynthia! It is not often that I get those out, but they are so lovely, especially on top of a colored plate like the gray ones. I always say you set a beautiful table. This one is no exception. I love the neutrals, it is so unusual. It is a lovely table setting. Your Thanksgiving Table is just beautiful. I love the colors of your table runner that really set a lovely tone for your warm and inviting table. Thanks so much for sharing your awesome post with us at Full Plate Thursday. Hope you are having a good week and come back to see us real soon! Thank you so much for inviting me to Full Plate Thursday. I will try to stop by again when I have another tablescape. Thank you so much, Mary Beth.